Disclaimer: I received a pack of FitSoks for review & GIVEAWAY purposes. I was not requested to write a positive review. All opinions are my own and I have received no monetary compensation for this post. Welcome to Day 9 of 11 Days of Giving! Thank you so much to FitSok but most of all, thank you for you! What a great end to the year giving away 11 of my very favorites! Recall that recently SD Dad and I had a chance to review FitSok and we loved them. So much so that I NEVER wear a different type of sock while running and he never wears a different type of sock while cycling anymore. I reached out to them for my Holiday RunGuide because if I was including all my favorites, I would HAVE to include FitSok. 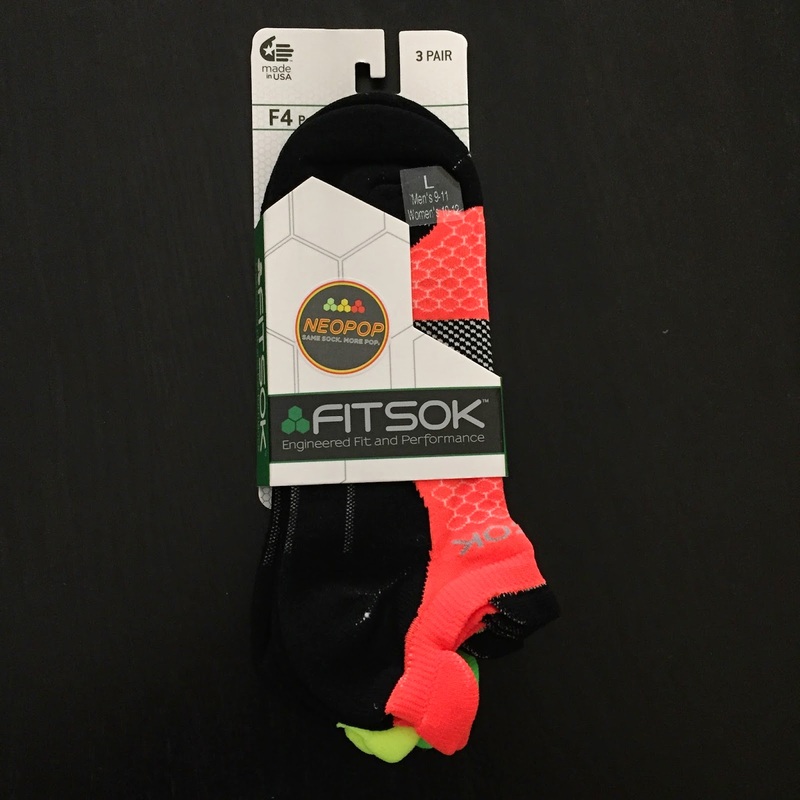 And being the generous souls they are, they said yes and sent me a pack of F4 NeoPop tech socks to review. Just like the ones I reviewed before, these are Right foot and Left foot specific. That means they pad your foot and compress your foot where it needs it. From their website: "Anatomical left-right foot construction allows for precise fit, while a unique cushioning system provides comfort in specific pressure areas. Achilles protection reduces blistering on the back of the foot, and a front tab protects against shoe friction. " And again, such FUN colors! I am such a huge fan of these socks and the company is so amazing. They really care about the athlete that wears their sock and want to make sure it is the best product for them. The nice people at FitSok are allowing me to GIVEAWAY a pack of NeoPop F4 in the winner's size. If you don't want to wait to see if you won, use code SDMOM15 for 15% off anything on their site. No purchase necessary. Void where prohibited. 1 winner will be selected via the Rafflecopter widget. Open to Residents of the United States 18 years of age or older. Winner(s) will be provided the prize directly from Fitsok. Substitutions may occur and SD Mom is not liable for failure of sponsor to deliver product. Be sure to come back tomorrow to check out the Giveaway from Pro Stretch +plus! I like a light cushiony sock that breathes well. I like that they are side specific, you get a better fit. I like soft comfortable socks that fit well in cool colors and these sound fabulous! I have only just recently started wearing socks that have a left and right. The ones I have found so far though are just white black or gray, so. I'd love to have some in cool colors. I like trying new socks that might help with my blister problem. I especially like the fun colors these come in! I like that they compress the feet and come in such bright and neon colors! I like my socks to be cushioned and especially breathable. Fun colors don't hurt either. I like a lightweight sock that does not rub against the foot (particularly the back of my heel) and cause blisters. I'm intrigued by the foot specific features of the F4! I like cushioning and no slipping. I really like the idea of a left and right sock! something that doesn't give me blisters on a long run! Comfortable socks that don't get holes easily! I love socks with cushioning. I love cushioned socks! The right and left foot option is always a plus, too! I like cushion, I like the compression factor. Feetures are my favorite, but I would love to try these! I look for cushioning nd compression. Breathability and long lasting is what I look for. I like that these socks have separate right and left specific sock as I'm sure that makes it more anatomically correct. I like long lasting and breathability in a sock. I like these socks as they have left and right specific socks. I like socks that are light and comfortable and feel so good that I don't have to think about my feet when I run. I love the left and right socks! I need wicking and a sock that's just tall enough that it's not going to be rubbed by my shoe and gradually inch down into it. One that will stand up to frequent washing! 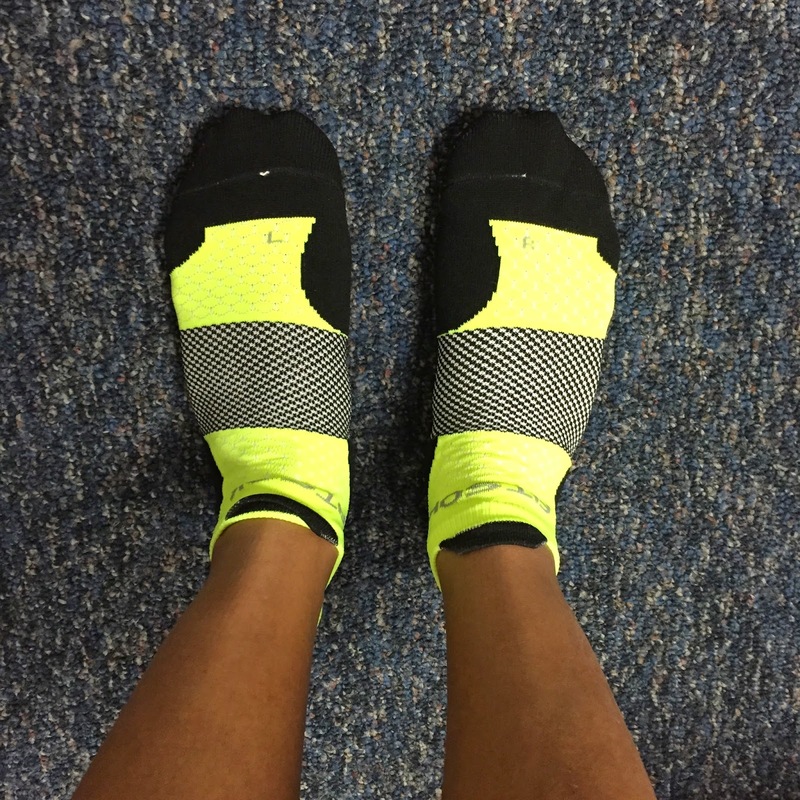 I look for ultra comfort in running socks--the cushioning aspect would be great!!! I have never wore anything other than regular socks. I am interested in trying something that supports the foot better. I would love to find a sock that doesn't stretch out after only a few wears. I've never tried socks that are side specific but always thought it would make sense. I look for compression in the arches. I have narrow feet so I usually have to buy smaller socks. The compression helps! I like socks that are ligjtweight and good for sweating. I just want them to be comfortable! I haven't had a problem with my regular Puma socks yet, but I want to get a good pair of running socks to see what I'm missing! So far, Feetures are my favorite socks and I love how these are R and L specific as well! I look for a sock that fits and doesn't slide off my heel. I like socks that are wicking and cushioning. I love socks that have the tab at the top! I love the right sock/left sock feature! Until I was a runner, I never understood that running socks matter. I look for arch support and comfort. I like socks that look good and are wicking. I like the tab on top. I look for a good, tight fitting sock. I like that it has supportive fit around the arch. I look for comfort especially in the toe area and not too tight. I like the right foot and left foot specific in the F4 socks. I'm looking for socks that prevent blisters... it sounds like the foot-specific padding is awesome for that! I look for cushion, that's what I like about these. 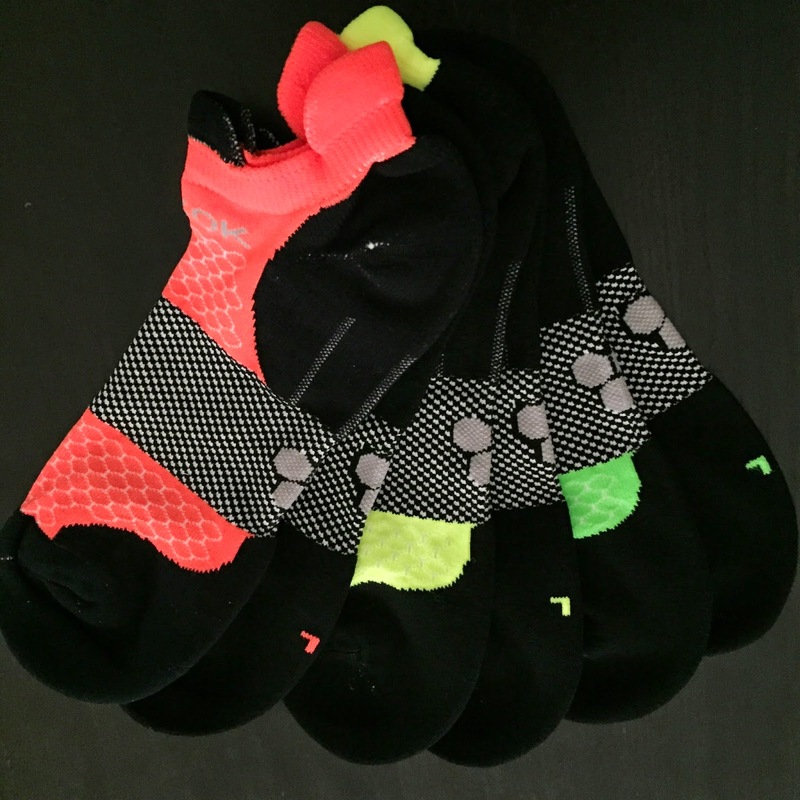 I look for socks that are comfortable, moisture wicking and don't fall down. I like that they compress my feet where needed.